Can we reclaim Christmas for the masses? Credit: Grace Wilson/STRIKE! magazine. It’s no surprise to discover that anarchist theorist Pyotr Kropotkin was interested in Christmas. In Russian culture, St. Nicholas (Николай Чудотворец) was revered as a defender of the oppressed, the weak and the disadvantaged. Kropotkin shared the sentiments. But there was also a family link. As everyone knows, Kropotkin could trace his ancestry to the ancient Rurik dynasty that ruled Russia before the upstart Romanovs and which, from the first century CE, controlled the trade routes between Moscow and the Byzantine Empire. Nicholas’s branch of the family had been sent out to patrol the Black Sea. But Nicholas was a spiritual man and sought an escape from the piracy and brigandage for which his Russian Viking family was famed. So he settled under a new name in the southern lands of the Empire, now Greece, and decided to use the wealth that he had amassed from his life of crime to alleviate the sufferings of the poor. Unpublished archival sources recently discovered in Moscow reveal that Kropotkin was fascinated by this family tie and the striking physical similarity between himself and the figure of Father Christmas, popularised by the publication of ‘A Visit from St. Nicholas’ (better known as ‘The Night Before Christmas’) in 1823. Kropotkin was not quite so portly as Klaus, but with a cushion stuffed up his tunic, he felt he could pass. His friend Elisée Reclus advised him to drop the fur trim on the outfit. That was a good idea as it would also allow him to wear a bit more black with the red. He’d decided to follow Elisée’s advice on the reindeer, too, and to use a hand driven sleigh. Kropotkin wasn’t normally given to dressing up. But exploiting the resemblance to spread the anarchist message was excellent propaganda by the deed. Anticipating ‘V’, Kropotkin thought that we could all pose as Santa Claus. On the edge of one page Kropotkin writes: "Infiltrate the stores, give away the toys!" And distribute them widely, to those who need care. His project notes also reveal some valuable insights into his ideas about the anarchistic features of Christmas and his thinking about the ways in which Victorian Christmas rituals might be adapted. "We all know", he wrote, "that the big stores – John Lewis, Harrods and Selfridges – are beginning to exploit the sales potential of Christmas, establishing magic caves, grottos and fantastic fairylands to lure our children and pressurise us to buy gifts that we do not want and cannot afford". "If you are one of us", he continued, "you will realise that the magic of Christmas depends on Father Christmas’s system of production, not the stores’ attempts to seduce you to consume useless luxuries". Kropotkin described the sprawling workshops at the North Pole, where elves worked all year, happily because they knew that they were producing for other peoples’ pleasure. Noting that these workshops were strictly not-for profit, craft-based and run on communal lines, Kropotkin treated them as prototypes for the factories of the future (outlined in Fields, Factories and Workshops). Some people, he felt, thought that Father Christmas’s dream to see that everyone received gifts on Christmas day, was quixotic. But it could be realised. Indeed, the extension of the workshops – which were quite expensive to run in the Arctic – would facilitate generalised production for need and the transformation of occasional gift-giving into regular sharing. "We need to tell the people", Kropotkin wrote, "that community workshops can be set up anywhere and that we can pool our resources to make sure that everybody has their needs met"! One of the issues that most bothered Kropotkin about Christmas was the way in which the inspirational role that Nicholas’s had played in conjuring Christmas myths had confused the ethics of Christmas. Nicholas was wrongly represented as a charitable, benevolent man: saintly because he was beneficent. Absorbed in the figure of Father Christmas, Nicholas’s motivations for giving had become further skewed by the Victorian’s fixation with children. Kropotkin didn’t really understand the links, but felt that it reflected an attempt to moralise childhood through a concept of purity that was symbolised in the birth of Jesus. Naturally he couldn’t imagine the creation of the Big Brother Santa Claus who knows when children are asleep and awake and comes to town apparently knowing which have dared to cry or pout. But sooner or later, he warned, this idea of purity would be used to distinguish naughty from nice children and only those in the latter group would be rewarded with presents. Whatever the case, it was important both to recover the principle of Nicholas’ compassion from this confusing mumbo-jumbo and the folkloric origins of Santa Claus. Nicholas gave because he was pained by his awareness of other peoples’ hardship. Though he wasn’t an assassin (as far as Kropotkin knew), he shared the same ethics as Sofia Petrovskaya. And while it was obviously important to worry about the well-being of children, the anarchist principle was to take account of everyone’s suffering. Similarly, the practice of giving was mistakenly thought to require the implementation of a centrally-directed plan, overseen by an omniscient administrator. This was quite wrong: Father Christmas came from the imagination of the people (just consider the range of local names that Nicholas had accrued – Sinterklaas, Tomte, de Kerstman). And the spreading of good cheer – through festivity – was organised from the bottom up. 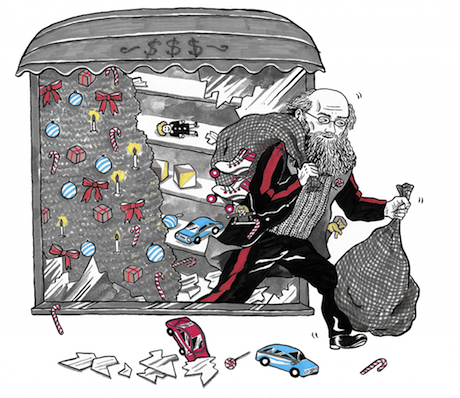 Buried in Christmas, Kropotkin argued, was the solidaristic principle of mutual aid. Kropotkin appreciated the significance of the ritual and the real value that individuals and communities attached to carnivals, acts of remembrance and commemoration. He no more wanted to abolish Christmas than he wished to see it republicanised through some wrong-headed bureaucratic re-ordering of the calendar. It was important, nonetheless, to detach the ethic that Christmas supported from the singularity of its celebration. Having a party was just that: extending the principle of mutual aid and compassion into everyday life was something else. In capitalist society, Christmas provided a space for special good behaviours. While it might be possible to be a Christian once a year, anarchism was for life. Kropotkin realised his propaganda would have the best chance of success if he could show how the anarchist message was also embedded in mainstream culture. His notes reveal that he looked particularly to Dickens’ A Christmas Carol to find a vehicle for his ideas. The book was widely credited with cementing ideas of love, merriment and goodwill in Christmas. Kropotkin found the genius of the book in its structure. What else was the story of Scrooge’s encounter with the ghosts of Christmas past, present and future than a prefigurative account of change? By seeing his present through his past, Scrooge was given the chance to alter his miserly ways and re-shape both his future and the future of the Cratchit family. Even if it was only remembered once a year, Kropotkin thought, Dickens’s book lent anarchists a perfect vehicle to teach this lesson: by altering what we do today, by modelling our behaviours on Nicholas, we can help construct a future which is Christmas! This article was originally published by STRIKE! magazine in 2014.